Not quite small enough to fit in your pocket, but sized just right for those lacking counter space, the DeLonghi 23210SB Superautomatic Espresso Machine manages to still pack quite a punch. What's to love about the 23210SB? 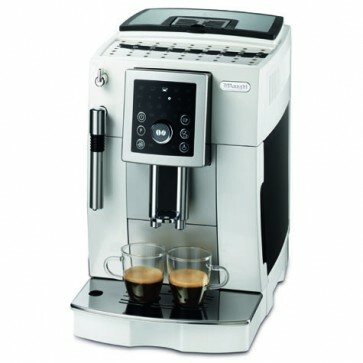 Other than being clad in a slick, silver casing, this diminutive DeLonghi features: easy-to-use rotary push-button control panel so you can efficiently choose your drink's temperature, coffee strength and cup size, a panarello wand to froth up drinks like a dream, and an instant heat boiler to consistently keep your coffee at the perfect temperature. Rotary Push-Button Control Panel - The rotary and push-button control panel allows users to choose their drink settings from the preset options for temperature, coffee strength (five settings) and cup size (four settings). 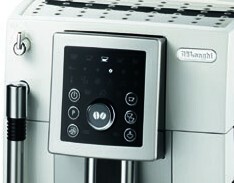 Hot Water Access - Comes with the ability to dispense hot water right from the steam wand. Decaf Accessible - The bypass doser allows you to bypass the grinder for pre-ground coffee, so it's easy to make the shift from grinding regular coffee beans to using pre-ground decaf beans. Thermoblock Strength - A patented instant heat thermoblock will consistently keep your coffee at the right temperature drink after drink. Cleaning Notification Maintaining your machine is made easy with the decalcification indicator. When it's time to clean out the pipes your machine will notify you of a calcium buildup, which could change the flavor and quality of your coffee. Compact - One of the smaller Superautos on the market, the DeLonghi ECAM 23210SB is great for small kitchens or limited office counter spaces. Built-In H2O Filter - Clean water equals fresh coffee. The ECAM 23210SB has an internal water filtration system to ensure the greatest tasting cup of coffee possible. Short Steam Wand - The steam wand's design is not very ergonomic and is a little shorter than we'd like, which makes frothing your milk a difficult at times. The DeLonghi ECAM 23210SB is great in size, but offers no other upgrades versus other Superautomatics.